When it gets cold, the warmth sets in. As contradictory as it sounds, it's true, especially in Bollywood. A whole lot of romance ensues when the happy hero and demure heroine get together against the vast landscapes of pristine white snow and dry, stark trees. The chillier it looks, the cozier they get. Isn't that what on-screen chemistry is all about? With the frosty weather making its presence felt in many parts of the country and across, here's sitting back, in your warmest woollies with a steaming cup of hot chocolate, to rivet over the Winter Wonderland of Bollywood. A slightly tipsy Kajol gets up, close and personal with her co-star of blockbuster films, Shah Rukh Khan frolicking about thick sheets of Swiss snow in a fancy red frock. The super couple is all set to flaunt their latest avatars together in buddy Karan Johar's My Name is Khan. 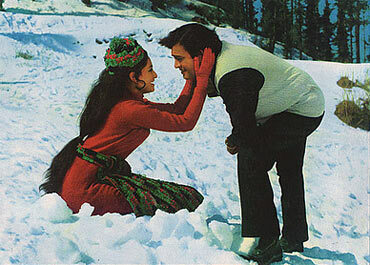 No one makes winters work like the evergreen jodi of Rishi Kapoor and Neetu Singh. Be it Khel Khel Mein or Kabhi Kabhie, their unbeatable combined cuteness could put penguins out of business. Yaaaaahooooo, he declares leaping, rolling, and somersaulting in the snow-clad hills of Kashmir. 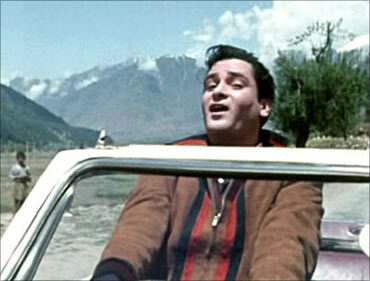 Shammi Kapoor makes this one of the most iconic images in and as Junglee. 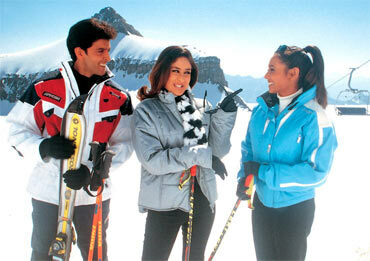 Yash Chopra's fascination with the Alps and all things white is well-known. And it's moments like the ones between Amitabh Bachchan and Rekha in Silsila that spell pure magic, which make us appreciate his fixation even more. This is not just mere snow. Madhuri Dixit sashays in slender blue chiffon against a comfortably bundled up Anil Kapoor around the dramatic glaciers of Alaska to convey the larger-than-life sentiments of her complex character in Pukar. Ranbir Kapoor and Minissha Lamba mix business with pleasure as they have the time of their lives on an utterly exciting Alpine coaster in Bachna Ae Haseeno. A pert Jaya Bachchan braves an onslaught of snow balls to the beats of R D Burman's bouncy ditty, Logon na maaro isse in a Wendy-inspired red body suit and balmy woolen cap with a mostly-amused Sanjeev Kumar in tow. 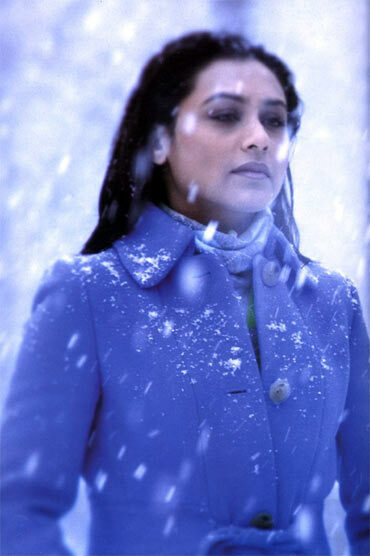 Trust the perennially pensive Rani Mukerji to look all serious amidst an enchanting snow fall in New York City. Still, quite a stunning sight, no? Thankfully, the actress lightens up to enjoy the first flakes of snow in Shimla with co-star Amitabh Bachchan in Sanjay Leela Bhansali's critically-acclaimed, Black. If the first half of Hrithik Roshan and Amisha Patel's debut romance, Kaho Naa... Pyaar Hai sees them romping about the silvery beaches of Thailand, the vivacious duo channel their attention to the snow-covered peaks of New Zealand for its remainder. It's not just Shrek, who has layers. 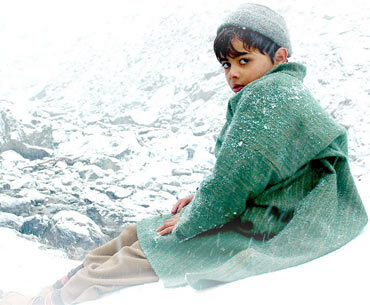 The cute-faced Purav Bhandare packs in some of his own, while enjoying the thrust of natural whites and numbing freeze of Kashmir in Santosh Sivan's picture-perfect fable. What's the point of snow if there's no skiing? Looks like that's exactly what Hrithik, Kareena and Rani appear to be discussing what with all the sporty gear on. Salman Khan and Sneha Ullal get a taste of Russian winters in Lucky. That explains the costumes. A really, really awkward Abhishek Bachchan and cool cat Aishwarya Rai do the Swiss song routine for Raj Kanwar's tacky Dhaai Akshar Prem Ke, an inspired remake of Keanu Reeves starrer A Walk in the Clouds. Honeymoon in paradise and yet Arvind Swamy looks none too pleased walking in the snow while lugging an evidently gleeful wifey. Needless to say, he drops her in the next shot before they kiss and make-up to sing an ode to Yeh haseen vadiyan through A R Rahman's spell-binding score in Roja.